Downloads are disabled. This page remains open only for documentations' purposes. 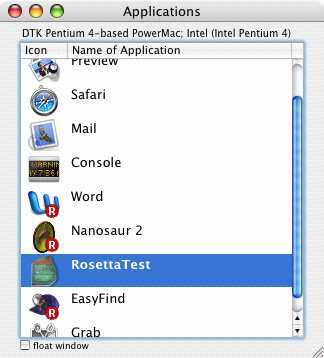 RosettaTest is a program to indicate whether an application in Mac OS X is running natively on a Mac powered by processors from Intel or is dynamically translated by Rosetta. If the program is translated, a small red indicator labelled 'R' is shown inside the application's icon. To download RosettaTest (0.89), click on the button. If you are committed to use this software, do it at your own risk! RosettaTest requires Mac OSX 10.4.4 (Tiger)! Support for RosettaTest is available, if your problem is with RosettaTest (as opposed to being a problem with Rosetta, Intel-processors or other products). Please do hesitate before you make any message available for (RosettaTest at lonsing dot com). 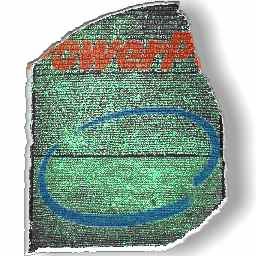 THIS SOFTWARE IS PROVIDED BY THE AUTHOR "AS IS" AND ANY EXPRESS OR IMPLIED WARRANTIES, INCLUDING, BUT NOT LIMITED TO, THE IMPLIED WARRANTIES OF MERCHANTABILITY AND FITNESS FOR A PARTICULAR PURPOSE ARE DISCLAIMED. IN NO EVENT SHALL THE AUTHOR BE LIABLE FOR ANY DIRECT, INDIRECT, INCIDENTAL, SPECIAL, EXEMPLARY, OR CONSEQUENTIAL DAMAGES (INCLUDING, BUT NOT LIMITED TO, PROCUREMENT OF SUBSTITUTE GOODS OR SERVICES; LOSS OF USE, DATA, OR PROFITS; OR BUSINESS INTERRUPTION) HOWEVER CAUSED AND ON ANY THEORY OF LIABILITY, WHETHER IN CONTRACT, STRICT LIABILITY, OR TORT (INCLUDING NEGLIGENCE OR OTHERWISE) ARISING IN ANY WAY OUT OF THE USE OF THIS SOFTWARE, EVEN IF ADVISED OF THE POSSIBILITY OF SUCH DAMAGE. Copyright 2006 - 20017 Werner Lonsing. All rights reserved. All trademarks are the property of their respective holders.